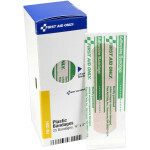 This 110-piece, 25-person bulk first aid kit is designed for use in small offices, vehicles and work sites. The partitioned, water-resistant plastic case is wall-mountable, yet has a handle for easy carrying. 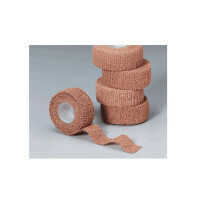 (20) Fabric bandages, 1" x 3"
(16) Adhesive plastic bandages, 1" x 3"
(1) Triangular sling/bandage, w/2 safety pins, 40"
(1) First aid tape roll, 1" x 5 yd. (1) Kit scissors, angled blades, 4"
The First Aid Only 25 Person Bulk First Aid Kit - Plastic Case.